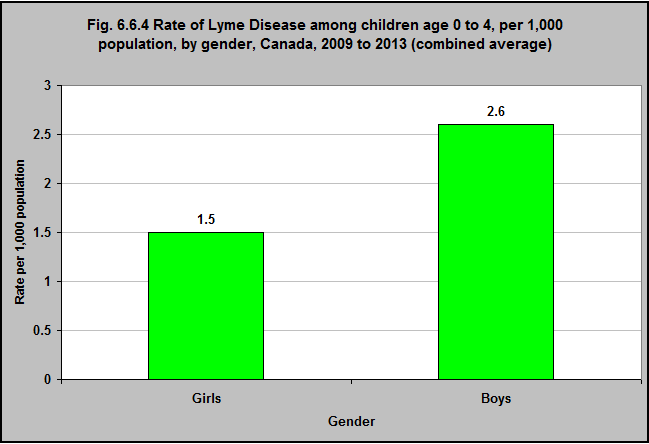 Source: CICH graphic created using data adapted from National Lyme Disease Surveillance in Canada 2013: Web Report. http://www.healthycanadians.gc.ca/publications/diseases-conditions-maladies-affections/lyme-surveillance-2013/index-eng.php#a4– accessed March 12th, 2017. In Canada, between 2009 and 2013 the incidence of Lyme Disease was 2.6 per 1,000 among boys aged 0 to 4 years. Among girls of the same age group it was 1.5 per 1,000 population.